Pretty annoying but today, a colleague helped me out. Turns out that the display settings were set to the specific resolution of my laptop and since that doesn't match the resolution of my second screen that explains the problem. So, very very easy solution: open Remote Desktop Connection and click the Options button to expand the window and get access to more options. 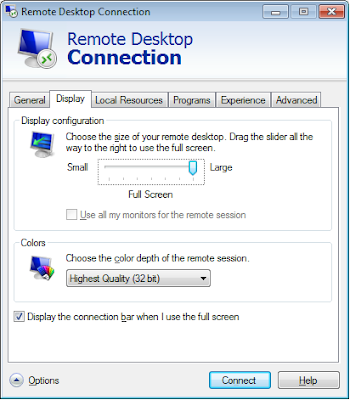 Click the Display tab and drag the slider underneath the Display configuration header all the way to the right to set it to full screen instead of a specific resolution. Note: I've noticed that the display settings can change when you drag the window to the other screen, so make sure you check them while the window is on the other screen to make sure that they are correct. Shortcut! Hitting Ctrl + Alt + Break/Pause will make the window fit the screen (not necessarily to the correct resolution settings though).